UNI-SOLAR portable solar chargers convert sunlight into electricity using United Solar Systems Corp. Triple Junction Technology. UNI-PAC portable chargers are extremely rugged, and their unique design makes them easy to carry and deploy. 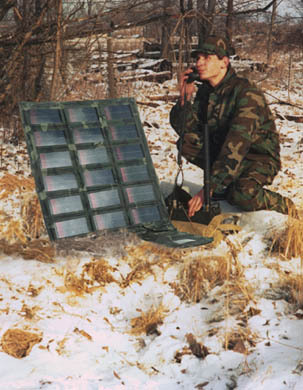 Solar modules for remote applications must be tough, lightweight and easy to transport. UNI-SOLAR UNI-PACs are designed for the challenge of the field. They provide power even with bullet holes or in partial shade. The UNI-PAC can be dropped, stepped on, packed and re-deployed, and will continue to operate. Field-proven as dependable and easy to use for military units, trekkers, climbers and professional photographers depend on the UNI-PAC for field communications, emergency power and battery maintenance. The UNI-PAC 10, 15 and 30 are covered by a 5-year warranty. The unique design of the UNI-PAC features a lightweight construction without glass or fragile crystalline to break, crack, or add on extra weight. 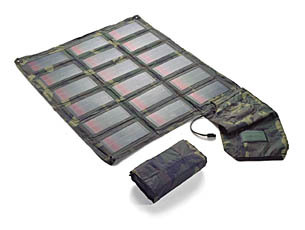 The tough nylon fabric covering allows the unit to be folded to a convenient book size, for easy storage and transport. The UNI-PAC 10 offers dual voltage charging for 12v and 24v, the UNI-PAC 15 and the UNI-PAC 30 are for 12v charging. The UNI-PAC was designed to meet military requirements for durability, performance and reliability. Tefzel&REG; (by DuPont) serves as a strong, long-lasting front cover. Individual solar laminates contain by-pass diodes, making the UNI-PAC solar chargers tolerant of severe shadow or partial covering. Charging rate and voltage can even be adjusted to meet specific needs.